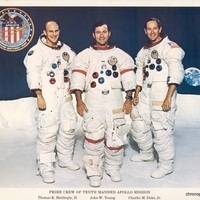 A pre-launch publicity photograph of the crew of Apollo 16. This mission was the 10th manned Apollo mission and it was the fifth to put astronauts on the Moon. Apollo 16 launched from Launch Complex 39A at John F. Kennedy Space Center in Merritt Island, Florida, on April 16, 1972 and returned on April 27. Photographed from left to right are Command Module Pilot Ken Mattingly (1936-), Mission Commander John Young (1930-), and Lunar Module Pilot Charles Duke (1935-). "Apollo 16." National Aeronautics and Space Administration. http://www.nasa.gov/mission_pages/apollo/missions/apollo16.html. National Aeronautics and Space Administration. 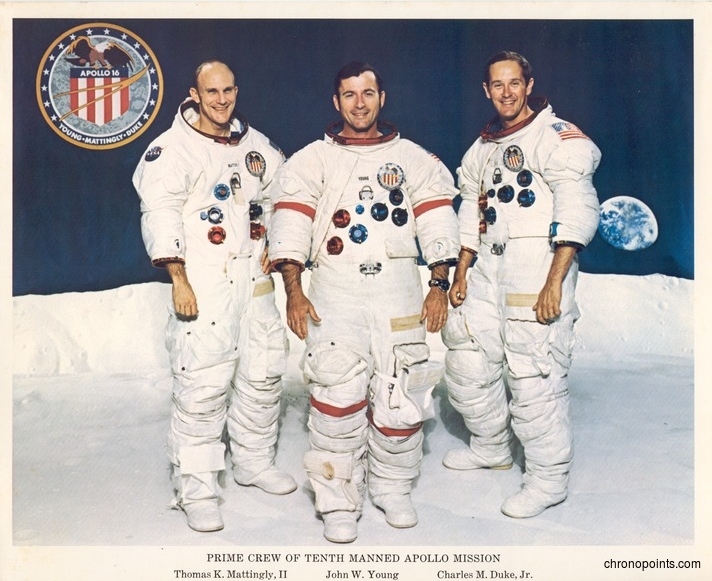 “Prime Crew of the Tenth Manned Apollo Mission.” RICHES of Central Florida accessed April 21, 2019, https://richesmi.cah.ucf.edu/omeka/items/show/6380.